In 2001, Erin faced a complete kidney failure that forced her to get on a transplant list and miss out on most of her college classes at Youngstown State. She received a kidney donated by her aunt, but just when things started turning around her body rejected the transplant. Later, she was to learn that she had a rare blood-clotting disorder that was part of the rejection issue. So Erin spent the last 13 years on a transplant waiting list, constantly battling the medical community to prove herself healthy enough to receive another kidney. She went through bariatric surgery to lose weight, set herself up to try to find a rare match through online communities and through it all (including 5 days of dialysis per week, with each treatment lasting around 5 hours) she managed last year to complete her degree as a Vet Tech. Each time Erin got close to receiving a kidney, there was another disappointment or set-back. Constant surgeries were also required to keep ports open for the dialysis treatment, which left her body battered and bruised- unable to even shower without special waterproof patches. 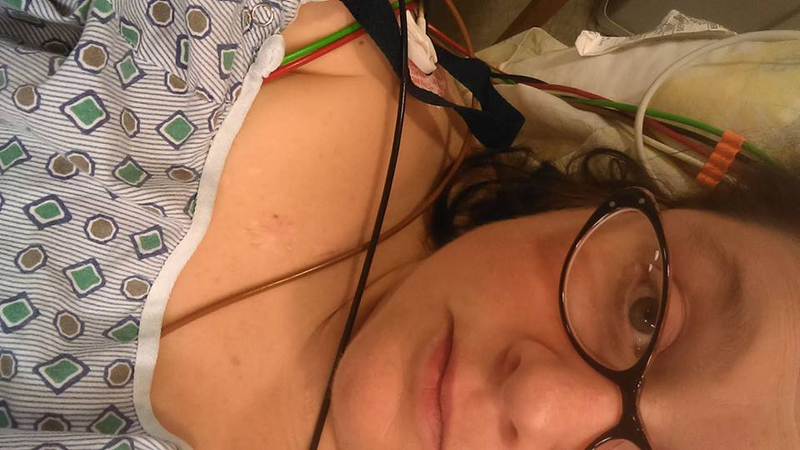 Last year, in 2016, on Erin's birthday, she passed out and ended up in the hospital for nearly a month. She was delusional from strong antibiotics and confused throughout her stay. She was in extreme pain from a condition known as Calciphylaxis, or calcific uremic arteriolopathy (CUA). CUA is a syndrome of calcification of the blood vessels, blood clots, and skin necrosis. It is seen mostly in patients with stage 5 chronic kidney disease, but can occur in the absence of kidney failure. It results in chronic non-healing wounds and is usually fatal. These hard painful open wounds on her stomach prevented her from being on the list for a transplant. 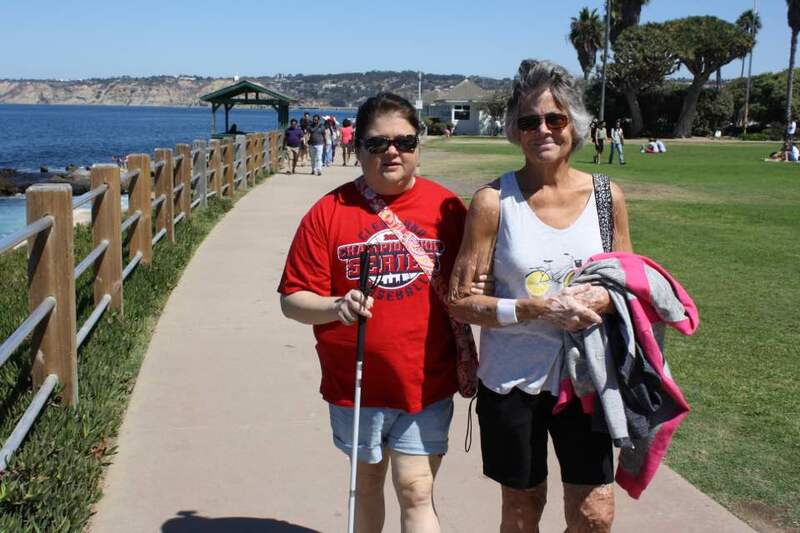 During Erin's hospital stay, she suffered a stroke and lost vision in her left eye completely. As if that wouldn't be discouraging enough, her mother Cathy who is her only support and caregiver, was diagnosed with Plasma Cell Leukemia. 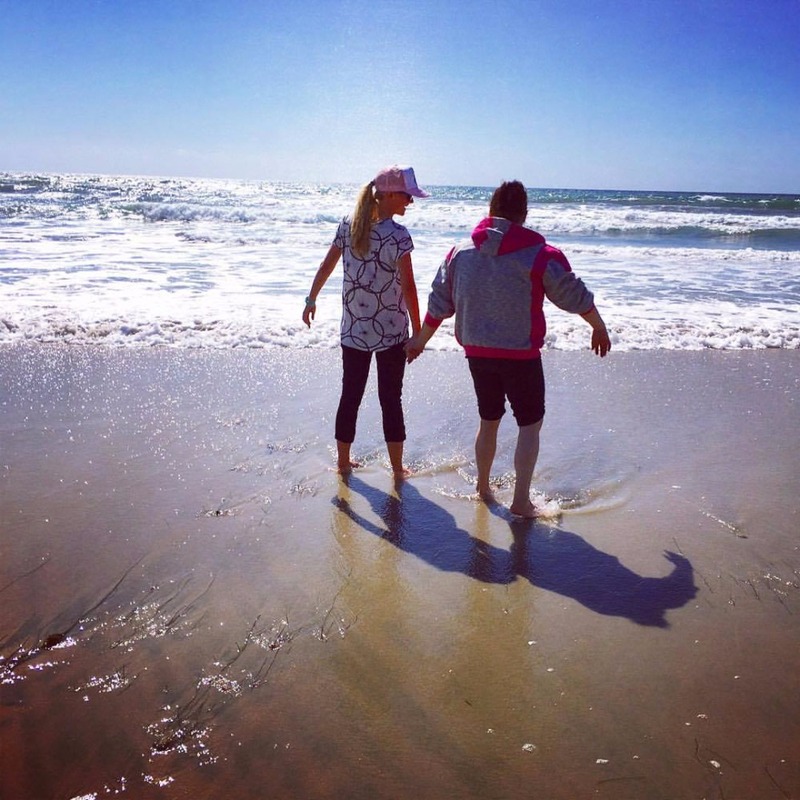 Miraculously, Erin and Cathy both fought through their diagnoses, and started healing. However, just as things began normalizing this summer, Erin was told that she would be removed from the transplant list as she was not deemed healthy enough to receive a kidney. Last week, Erin was rushed back to the hospital as she lost vision completely in her right eye. Her vision is completely gone now. Her optic nerve in her right eye is swollen and has been for sometime. They said they think the swelling is caused by her low blood pressure and her clotting disorder, which starved her optic nerve or oxygen. Erin is devastated and scared. Neither her mother nor she can work and have no incoming funds other than a small amount of government assistance each month. They face mounting medical bills for treatments and medication. Additionally, Erin will need help adapting to her new challenge of being blind. She could use a seeing eye dog, modifications to their home, and perhaps training to learn how to get around. This is urgent and any amount that you can offer will directly benefit Erin to get the help she so desperately needs at this time. Please consider giving any amount that you can. Through this all, Erin has been nothing but positive and optimistic. She has only broken down to me privately a small handful of times. She is a source of inspiration and her strength is unbelieveable. Please pay it forward and show her how much you love and care for her. Hi ! I visited with Erin and Cathy over Thanksgiving and they both have colds but are in good spirits. Erin has been dealing with low blood pressure that causes her to shake and sometimes faint when she stands up. She fell in her bedroom and hit her head then bumped her head again into an open kitchen cupboard. She has a nice little goose egg but is otherwise fine! She was really happy and grateful to receive the funding through this campaign. She used $975 of the funds you've helped to provide on a computer program called Jaws. The program claims it will allow her to regain about 95% of what she was doing before once she gets training. Over the holiday, I went to her house and spent a couple hours visiting and installing the program onto her computer. I tested it out and it reads her screen out loud to her, even websites. Because she can't use a mouse, she will have to learn a whole book full of keyboard shortcuts to navigate through the screens but I have full faith that this won't take her long! She also spent $130 on some gadgets to help her with her daily life. One item was an item locator that she can attach some sensors to three different items and then she has a little keychain that has three different buttons. So she could put a sensor on her cane for example and another on her phone so if she loses things she can just push her keychain and locate them. She also bought a thermometer that will tell her what her body temperature is because it is important for her to keep track of that. She also bought a digital scale that will announce over voice her weight. She has to track her weight daily due to being on dialysis so she doesn't drink too many fluids and overdo herself between treatments. She has found some other $10-$20 items also that have helped her around the house. 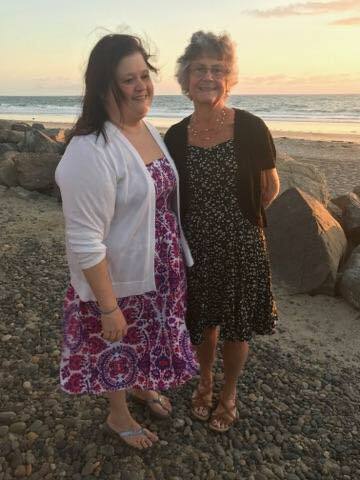 In late September, we used some airline miles and flew Erin and Cathy out to San Diego to stay with my husband and I. Erin had spent time out here while she had sight and her dream was to give her mom a chance to see the sunset over the Pacific Ocean for the first time. They spent a week enjoying the beach and some healthy California-inspired home cooking. Erin even talked me into taking her on a roller coaster!! Oh my goodness, that is a memory I will never forget. It was like we were kids again. Erin still had to go to here dialysis appointments at a center out her and was not getting done and home until 1 AM but you wouldn't hear a single complaint from her. From Erin, Cathy and myself, thank you everyone for helping with the funds that will allow Erin to pay for training with her cane, with her new computer program and for the devices around the house that will help her to live the most normal life possible. It takes a village and I'm very proud to be from a village that has poured out so much love and support for Erin and Cathy. Carla and Erin dipping their toes in! Today I got to visit with Erin. We spent a lot of time reading through all of the kind comments and donations. She was so happy to hear from everyone and appreciates all the kind words and support. She already has plans for how to make the most use of these generous funds. First and foremost she is looking into a seeing eye dog program. The dog will receive $50,000 worth of training at her no expense to her, however she will have to attend three weeks of on site training with the dog in either NY, NJ or Columbus. The waiting list is 1-2 years but she's going to get on the list now that she knows she'll have the funds to travel to the training. She is also looking into certification of one her current dogs as an emotional support dog. This is $200. Perhaps most importantly she is researching voiceover programs for the computer and she upgraded to an iPhone from her basic flip phone so she now has talk to text capabilities. Disabilities Services will charge $95 per hour since she is under 60 years old and a minimum of 8 hours to train her to walk with a cane. She is hoping some financial assistance comes through but in the meanwhile, this fund will help get that started. Erin's mom received a catalog of household items for the visually impaired that we are looking through such as microwaves and thermostats so Erin can maintain independent living. Erin's mom continues with her chemo treatments and her main concern is making sure Erin is set with independent living. Feel free to reach out with any questions or messages. Thank you again for sharing your kindness with Erin. Hi Everyone! I just wanted to share a short update and let you know that I'm back in Ohio and I will be visiting Erin this week. I am withdrawing the funds we have raised so far so that I can present her with a check. I will read to her the names of all the donors and all the comments. As a gift, I got her an Amazon Echo and she wants me to set it up for her so she can dictate a thank you message and a personal update on her Facebook. She is now using talk-to-text on her phone and we have been able to text each other quite a bit recently! Stay tuned...more to come. Thank you again from the bottom of our hearts. I spoke to Erin's mom Cathy this weekend and here are some updates. She is home from the hospital and comfortable. She has gone to her dialysis appointments but obviously can't drive anymore, so if you're a local friend rides may be appreciated some days. Her mom was able to get Erin onto World of War Craft. While she can't play, she was able to chat on the microphone with the friends she plays with on the site. That made her very happy and she played from about 7:30 pm to midnight! Currently, Cathy is getting Erin set up with the Sight Center in Cleveland. They will acclimate her to using a cane and teach her independent living skills. 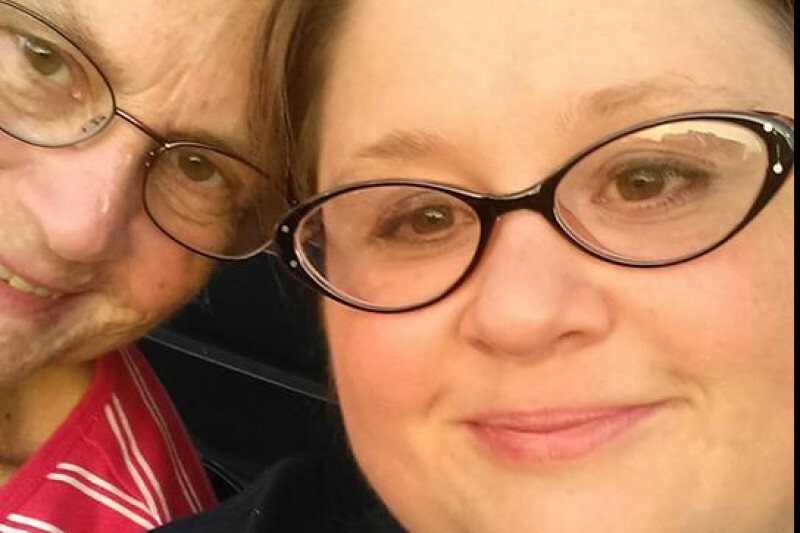 Cathy is going to research assisted living homes in the local area also because she wants Erin to learn how to live on her own- in the event that Cathy's cancer progresses. As for pets, Erin knows that the burden of cleaning up cages now falls on her mom and has volunteered to give up her guinea pigs and gerbils. Those will be re-homed on the 17th. She also cleaned out her aquariums. She will be keeping her rabbit, 4 dogs (though Frankie and Hudson are getting on in years) and her cats (14, 15, 16 years old). The dogs have not left her side since she got home. Cathy is really adapting and thinking of creative solutions to help Erin acclimate. She bought those jewel nail art stick-ons and has placed them on the call and hang-up buttons on her phone. She also put one on the 30 second button on the microwave. Erin is comfortable using the microwave but is still afraid to use the stove. She can find her way around the house just fine and is able to make herself PB&J and ham sandwiches. She eats on her own with silverware. Her mom just tells her "the meat is at 3 o'clock, the potatoes at 6 o'clock and the veggies at midnight" etc. Cathy is trying to get a program for her computer that will read her emails to her and allow her to dictate responses back. She is also going to take her to Verizon on Monday to get talk to text set up on her phone plan. She got an alarm clock that tells her aloud what time it is and a phone that she can answer (connected to their home landline). She said none of these things are too expensive on their own, but they add up- so the GoFundMe support will be a big help. At the time I spoke with Cathy, she was relaxing at her favorite coffee shop because in true Erin fashion of worrying about everyone else, she said her mom needed some de-stress time and ordered her to go relax until it was time to pick her up from dialysis.